How much physical exercise do I need? How long should my physical exercise be? At what intensity should I do my exercise? Physical activity is any activity that involves major muscle groups, including routine daily activities such as shopping or climbing stairs. Exercise includes any activity done with a goal of improving or maintaining physical fitness. Physical fitness can be described as the ability to carry out daily tasks with vigor and alertness, without excessive fatigue, and with ample energy to enjoy leisure time pursuits and meet unforeseen emergencies. Most of the research that supports the 150-minute mark is based on aerobic exercise. This can cover a range of choices, such as power walking, running, cycling, swimming or fitness classes. Everyday activities can count toward your 150 minutes, too, such as cleaning the house, or walking to the store. Also, you should include strength training! The other part of the 150-minute weekly guideline is intensity: you need to maintain moderate intensity during exercise. There are several ways to measure your exercise intensity. One of the easiest is the talk test. You should be able to talk and carry on a conversation, but not be able to say multiple sentences in a row, or sing a song. Another way is to wear a heart rate monitor. A monitor can help you find that ideal workout intensity and maintain it (see picture). Ask an Exercise Specialist for help, who can also teach you to be monitor your body, so you can begin to recognize when you are working too hard or not hard enough. Maximum heart rate is an estimate of the highest heart rate a person could reach while exercising strenuously. The usual formula for calculating maximum heart rate is 220 minus your age. 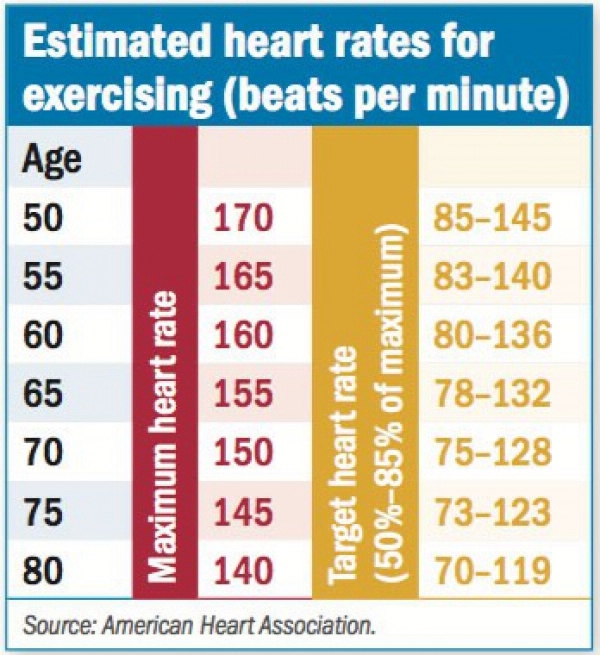 Target heart rate is between 50% and 85% of your maximum heart rate (see the table at right). Moderate-intensity levels often fall between 50% and 69%. It is ideal to begin at 50% and increase as your fitness level allows. Also, be mindful that some medications can affect your target heart rate zone. And if you have any history of cardiovascular problems, make sure you discuss your target heart rate with your physician. For those who are starting a new exercise program (i.e. running or exercise classes) it is important to follow the 10 percent rule. You should never increase your mileage or minutes spent exercising more than 10 percent per week.